Just in case you’re wondering, YES, I still love the color turquoise! 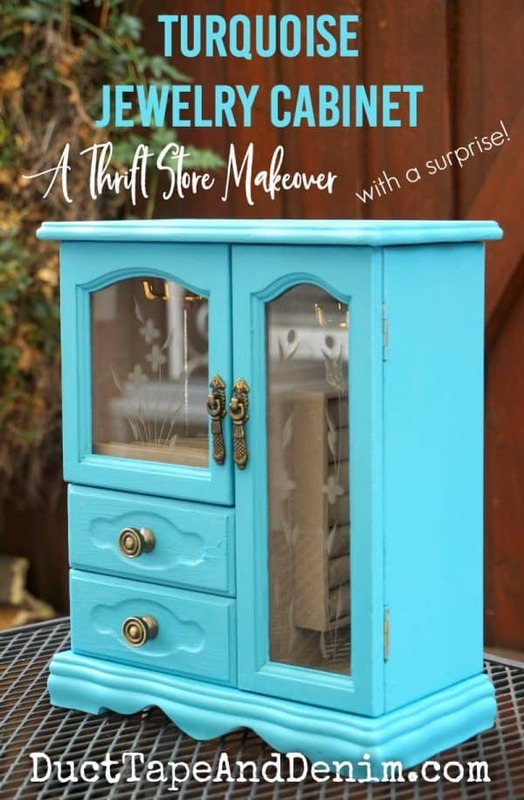 And this turquoise jewelry cabinet has a secret…. scroll down to see what it is! (Hint: It has to do with decoupage paper!) Here’s what it looked like when I found it at Goodwill. I think it was $5.99. A little high for a piece that’s missing a handle but I had some handles at home that I knew would work with it. This post contains affiliate links. You won’t pay any more when you use these but I will earn a small commission on any purchases you make after clicking on them and I greatly appreciate it. DecoArt also supplies the paint and paper for me. The project ideas and opinions are my own. Thanks for helping support my little blog!!! 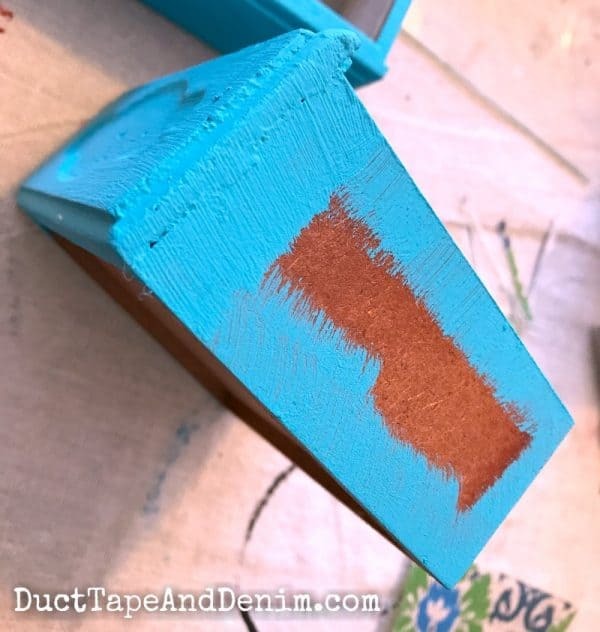 This chalky finish paint is one of my favorites because it doesn’t need any prep. 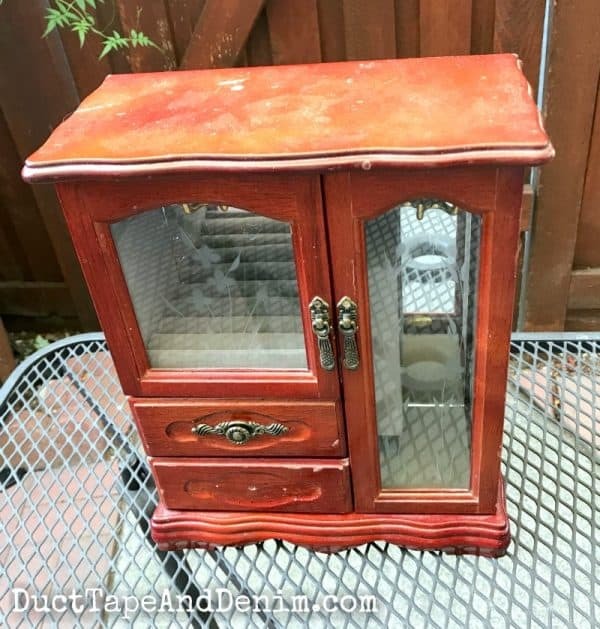 This cabinet was a little dirtier than most so I did clean it with some all purpose spray. But no sanding! I gave it a couple of coats of paint, let it dry, then applied a coat of varnish. I was planning to cover the sides of the drawers so they didn’t need to be painted. But I wanted to make sure that none of the old wood was showing so I just painted the edges. This was the first time I used the decoupage papers from DecoArt but I love them! You’ve seen me decoupage with tissue paper before. Regular tissue paper gets very fragile when it’s wet and I usually end up tearing it and trying to stick it back together. This paper is just a bit thicker and it didn’t tear at all! I brushed on a thin layer of decoupage medium, layed the paper over it, then brushed another thin layer over. My Ulta card came in handy. I used it to smooth out the bubbles. 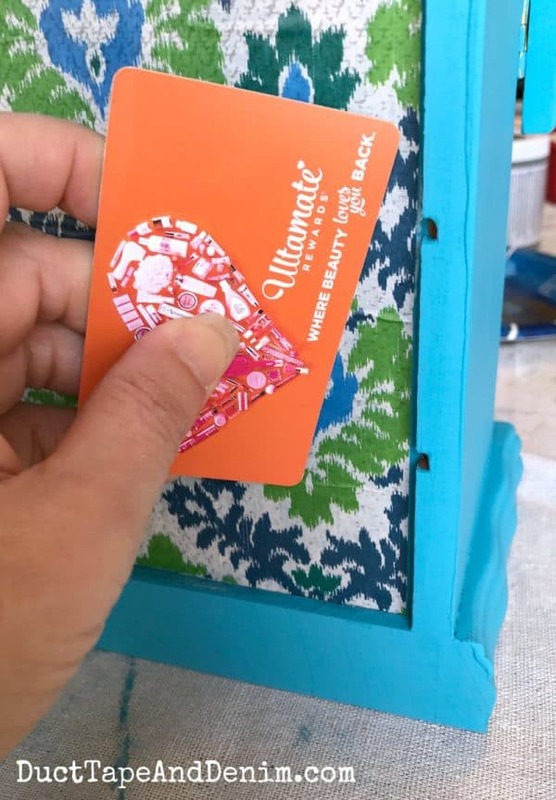 Not many people will see the back but I wanted it to be pretty, too, so I added some decoupage paper in the indented part. 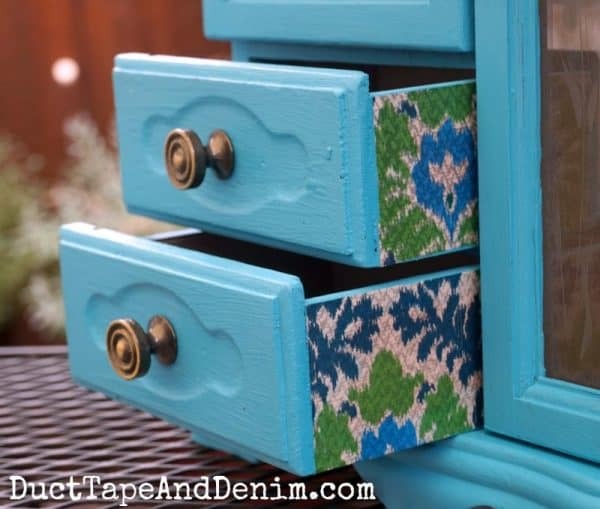 When everything was dry I drilled holes in the drawers and added new handles. These came from D. Lawless Hardware. Don’t miss the Facebook Live where I showed my order from D. Lawless. They were a perfect fit! The glass was nice on this one so I just cleaned it up and put it back in. What do you think? Should I do another color next time? 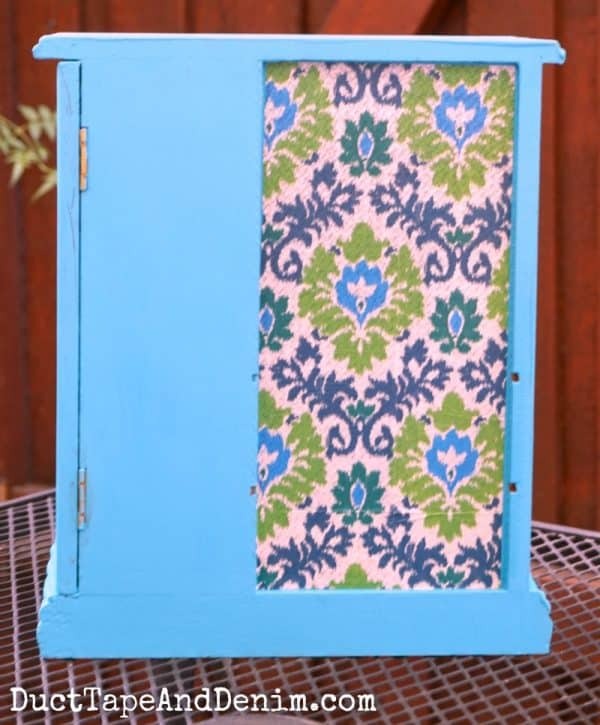 Have you ever painted a jewelry cabinet? Leave a comment and let me know. We join these blog parties. Featured on Dream, Create, Inspire, Create Link Inspire. I love it, and I think that the colorr is perfect! I love your choice of paper, it goes together very nice. The little pull knobs are a great addition to finish off an already perfect jewelry box. Love the colour you have chosen and the flashes of pattern paper. It looks very pretty now!